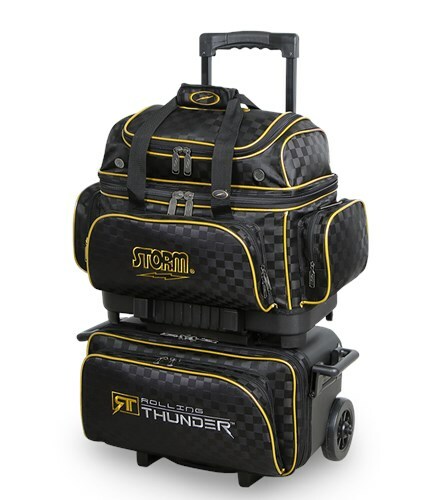 Storm continues their high tech bowling bag line with the Rolling Thunder 4 Ball Roller. This bag contains lots of high performance features such as 3 high tech wheels a locking, telescopic handle with grip release and everything inbetween. Storm thought of everything with this bag including a detachable 2 ball tote that can be used independently of the rest of the bag. What else could you need? Due to the time it takes to produce the Storm Rolling Thunder 4 Ball Roller Checkered Black/Gold ball it will ship in immediately. We cannot ship this ball outside the United States.